Remarkety is a leading Email Marketing Automation Platform for eCommerce. A data-driven email marketing system designed from the ground up to work with your eCommerce website. With Remarkety you can segment your customer list and prospects based on real time shopping behavior on your website and purchase history. - Built in templates cover a wide use case, but also easy enough to make and modify templates that work in the drag and drop editor - my content guys have had no issues at all using the wysiwyg editor - I was able to make our responsive email template from another platform compatible with Remarkety in a few hours. Pros: Remarkety saves us a huge amount of time because it automates email marketing based on an almost unlimited number of triggers that we can customize. It would take a huge team of people to manually send all of the different types of marketing emails on a continual basis that Remarkety automatically sends after we configure it one time in our account. Remarkety helps generate a tremendous amount of sales revenue for us while at the same time saving us a huge amount of time and money. Cons: I have not really found any serious negatives with Remarkety. The only thing I can even think of that would make it better is a few additional customizations that we would like when building emails and the ability to insert the Remarkety tracking into emails that are not sent through our Remerkety account. 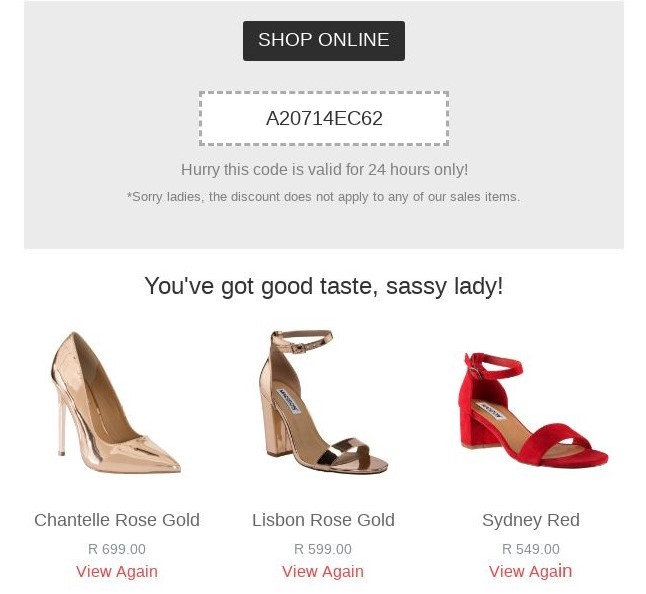 For example when a customer does a password reset on our site it would be nice if we could insert the Remarkety tracking into the password reset email or an order confirmation email. Overall: Overall we love Remarkety! The software is simple to use and allows us to easily track how well its working with their analytics. Additionally, our dedicated support rep has been excellent. She is always quick to answer questions by email and phone and she has helped us configure our email sending to maximize user engagement and sales. Overall: I've been a Constant Contact customer, Bronto, And MailChimp. Bronto is crazy expensive for a small company. MailChimp is cheap, but extremely limited. I wanted advanced automation for thinks like abandoned cart recovery, customer win backs, etc. I decided on Remarkety based partially on price. They seemed to deliver most of what Klaviyo does at a lower price. Initially, my customer success manager wasn't very good and I was feeling neglected by Remarkety. Also, they did not integrate with my rewards program, so I gave Klaviyo a try. Klaviyo could not do some very basic things I wanted to do, that I was already doing with Remarkety. I called Remarkety. My new customer success manager called me back immediately. The support since then has been exceptional. Remarkety has made improvements to their platform based on my suggestions. I get excellent LIVE support from Remarkety. Klaviyo is by chat only. My customer success manager and I have weekly strategy calls now. They have added integration with my rewards program. I highly recommend Remarkety for small businesses that don't have a staff of people to manage their emails and want to take advantage of customization and automation. Easy to use and worth every penny. Pros: It makes it easy to send out weekly newsletters to customers, both current and new. 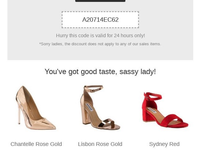 I can send automations for when people abandon their cart or browse abandonment. This really helps get people back to the site. A lot of times people who abandon their cart get a second look and do decide to buy. It's great as a tool for getting Google reviews because you can send out an automation that deals with feedback. Even going so far as to send them a link for both your Google reviews, and you're Better Business Bureau reviews. Cons: Probably the only thing I can honestly say I wish that the software had, is that I could do custom coded Scripts. Overall: By using this software, i am able to gain more conversions and keep my customers up to date. Good software. Lots of segmentation options which is great. Generally easy to use. Pros: The segmentations and automations are great. Can really drill down and narrow your audience. Automations really help in having a robust email marketing campaign without much work. The software is easy to use and everything is pretty intuitive. Cons: Email templates could be better designed (see Mailchimp, Aweber, etc.). Image library could use improvement. For example the ability to organize into folders. The ability to search for an image and the ability to archive images would also be very helpful. Right now, adding images to an email is the longest part of the process. Pros: We have used the Remarkety platform for years and always been happy with it! The program is user-friendly and it's easy to get many campaigns up and running. The design templates they provide look professional and what's more, they DO catch customers' eyes. We've always had a better ROI with the Remarkety platform than other email marketing platforms we've tried, including direct. Their support is very helpful and quick to respond on any needs you have. Pros: The automations are excellent and I only spend less than 30 minutes a week to send out newsletters and campaigns. It stays on auto pilot as it delivers great returns. The pricing is very good compared to other software that are more complicated. Cons: Improved customer support will be greatly appreciated although the software is mostly on auto pilot once you configure it at the onset. Overall: Easy to operate and gets the job done. The price is reasonable and any one can use it. 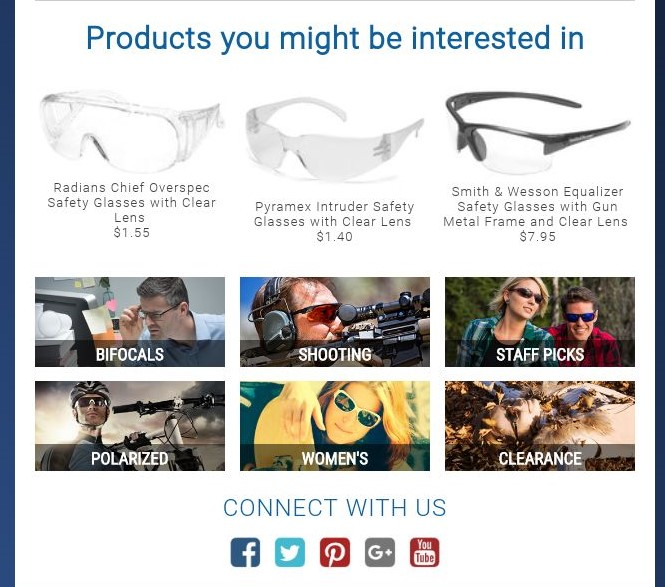 Pros: I have Remarkety connected to Shopify, and my favorite part about it is the level of segmentation I can achieve so I can target specific customers. Also their customer service is TOP NOTCH! Any time I need help with something, or have questions, they respond within a day and walk me through what I need to do, or do it for me! Also, I have made suggestions about possible integrations, and they have listened and implemented those suggestions! I find this software far exceeds Mailchimp and a few others I have tried. It's a must for my online store. Cons: I would like to see even more design capabilities. I think the design features right now are good, but I think they can make them even better! Pros: They have user-friendly tools for setting up email remarketing campaigns that have always made things simple for us. Cons: Not any complaints, really. I've spotted a couple bugs on the site but nothing serious, and they all have eventually been fixed. Overall: They have excellent customer service. Any time I have a question or issue with the software, they respond quickly to help me get things figured out. Remarkety works well for me. Pros: I like the flexibility this software provides. 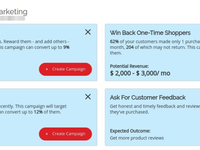 It makes it easy to create custom campaigns to target groups of customers. Cons: Once a campaign is set to a certain template, you cannot change the template. Also, it gave me an error once I tried to submit this review because I did not enter enough characters. I like to keep things brief and direct. Great email marketing solution. Would recommend to anyone. Pros: Easy to use, great features and great customer support. Many times I have approached them for help and they've got back to me straight away. Cons: There's currently no "Manage my preferences" panel, where email subscribers can edit their preferences in regard to receiving emails. Pros: We can easily send out targeted emails. We can easily see responses. We can easily set up newsletters as well as Automations. Cons: We cannot easily track the response to specific products customers have clicked within an email. We cannot combine results from multiple emails in the same campaign. We cannot update a customers email address and retain the order history. Overall: We easily send out professional emails and see the results in sales. Our company had been able to increase revenue with follow up emails and great looking newsletters. Pros: The software is really easy to use and I love how it makes suggestions for follow up emails that should be created. Cons: There were a few things we needed the software to do that it wouldn't do, but after working with the customer support team, they were able to create the functionality that we needed. Overall: Great reporting, customized email functions, great customer support, increased revenue, email suggestions. improved email design. Pros: Setting up our Automations was easy. Building our frequent Newsletters is also easy. We have made requests / recommendations for features that we would like to see, and the programming team has been very responsive and enthusiastic to implement these updates. Very pleased to be able to help improve the product even more. Pricing is excellent for the services provided. We look forward to a long relationship with Remarkety. Cons: There is some functionality we would love to have, but we also understand that Remarkety is not mean to necessarily be a solution for ALL of our needs in every manner we desire. They do offer good basic functionality, so this is by no means a complaint. Overall: Great Customer Service and Support. Always responsive and helpful. If they don't immediately know how to fix an issue, they stick with it until they figure it out. We are in the Beauty industry, which is not listed in the options for Industry (yet). Pros: I love that there are premade email templates that are based off best practices. 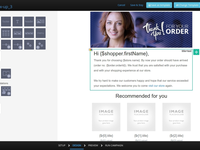 It's easy to segment our customer list based on purchase history and email interaction. Cons: The email pop up could be more robust, but it's also nice that they even have a template of this for users. Overall: Ease of use so I can produce more email campaigns quickly. Pros: Love the easy ability to follow up with customers and potential prospects. Email Marketing at it's best with great pricing and ease of use. Pros: Very easy to use. A/B Testing. Priced right. Intuitive. Quickly scales with increased business needs. Cons: Needs a larger responsive design catalog. Pros: It's really easy to create newsletters and automated campaigns. I love the fact that you can create segments for all your customers and send them targeted emails. Cons: The cost is quite high if you have a lot of contacts which makes the ROI quite low unless you send thousands of emails a day. Pros: We enjoy how we can tweak our messaging and have control over when a message is deployed along with detailed analytics. Cons: Would like to have more control over the design aspect of the email and be able to set messaging according to timezone since we have customers in the east and west coast. 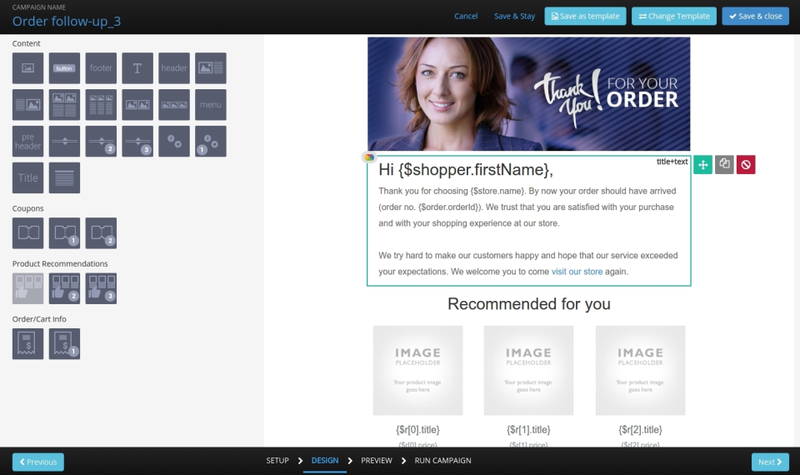 Remarkety has taken our email marketing to the next level with easy integration and simple UI. Pros: The ease of setting up, designing, & sending campaigns is unmatched. Complicated automation rules are made easy and can be set up in minutes. 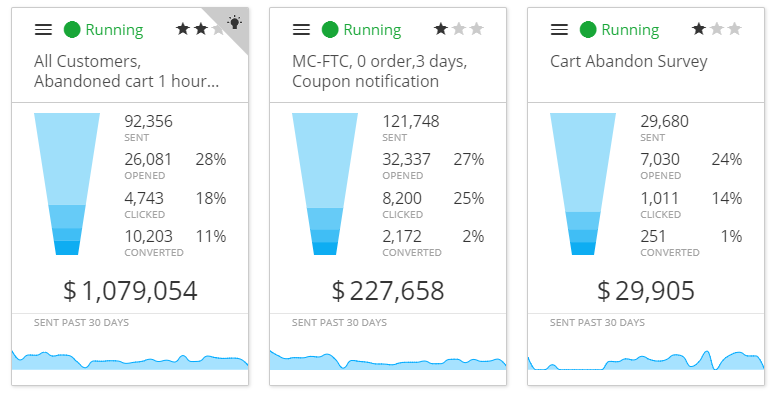 Tracking campaign success in a centralized report is great for on the fly data decisions. Cons: Compared to other alternatives, continual improvements/features seem to be limited. It would be nice to get more email design options, ways to segment, etc each month. Pros: We used Remarkety for around a year. The software has some fantastic marketing automation features, CRM integration and list management is great. Cons: Integration with Magento 2 was lacking and the support to fix it wasn't available. Comments: Automation is at the heart of Remarkety's platform. Business owners can effectively increase engagement, interaction, and conversions on their websites with minimal effort, since Remarkety's entire system is fully automated and ready-to-use. Not only does Remarkety recommend specific marketing activities based on a company's historical data, but the platform is also able to optimize activities and campaigns based on performance and actual results. Business owners can easily determine whether Remarkety is living up to their expectations, and whether they are generating a positive ROI, by reviewing the performance of their activities. Companies can clearly see how much money they have made as a direct result of their Remarkety campaigns - like email messages and rewards programs - without having to do any math or advanced calculations. Remarkety guarantees that businesses will see an increase in sales when they use its email marketing platform. If for any reason a company decides to stop using the product after three months, Remarkety will completely refund all previous payments. Pros: Email targeting leads to high email open rates. Cons: Because Remarkety is still new, the company's knowledge base is still growing. Pros: Ability to create a variety of split tests with in depth triggering. This has allowed us to really dial in our campaigns for maximum return. Cons: Sometimes the and/if/or statements of rules can become a bit lost, but an email to support usually resolves our questions. Overall: After using many other platforms, I keep coming back to remarkety for the best access to fine-tuning our campaigns. An excellent tool for analysing your business and offering custom content based on that. Pros: The pre-built automation is great as you effectively have templates for things like abandoned carts, inactive customers etc. Cons: The cost. Only for the fact we have to pay in USD and are an Australian business. This unfortunately makes the software a little expensive for us. Overall: A better understanding of my database; average spend of customers, how often they shop and much more. This software is the bomb!!!! In other words the best! Pros: I absolutely love this software. From the platform to the support they are a world class company I would recommend to anyone! Cons: There is really not a lot of cons. Everything I have recommended they have done. Maybe a more robust image hosting area, but they said they are redoing that soon, so there you go. Paid for itself in the first month and every month after! Pros: Extreme ease of use and great user interface, anyone can do it from the start. We started with just the abandoned carts and are now doing weekly emails with great success. Cons: Nothing to not like so far, every step of the way has been easy for a beginner like me. Easiest piece of marketing software I've ever used. Cons: Automated product recommendations logic is a bit basic, Remarkety says they're working on improving it - but no options yet. Took us awhile to recognize the value of Remarkety, now our marketing strategy is based on it. Pros: The templates make drafting new emails very easy and fast. The metrics allow you to keep a close eye on what is working and what isn't. Cons: Would be good to be able to re-name old campaigns so they are easier to find when looking at what we've already sent. Pros: Easy to use and works well with lots of options. We have used many different systems in the past but this is by far the best. Cons: Nothing so far! We have used all of the features available and it is the best in its field by sure as agreed by all of our staff. Pros: Support is very good when you have an issue. Seems to create sales during automation emails going out. Cons: Seems like many emails do not get opened when doing news letters. The automation seems to work somewhat. It's really what you put into it is what you will get out. There is so much to do running a business, for the price of software, I think they should have more interaction with customers to increase our sales. Good software, excellent customer service. I've had a great experience with Remarkety and I would recommend it. Pros: As a small business owner who is responsible for wearing many hats, it makes automated emails and campaigns much easier to run. We switched from MailChimp because the segmenting on MailChimp was too difficult to figure out. Now that I have the hang of the software I am able to test different options with very little time investment. My customer rep was amazing in the beginning - she scheduled weekly calls with me and helped me kick off my campaign. Cons: There is very little about the software I dislike. I had a few integration issues in the beginning and the technical support was superb in responding and helping me out. What I would truly love to see is a weekly "tips" email that assists its users in developing the use. I use a few programs that offer the tips and as a result, I am fully vested in their product because they continue to help me get the most of the software. I would love to see Remarkety do this. Cons: The email part of the program is not working and never has. Support is bad in this area. In the year we have used the program we still have not been able to do newsletters and have bad support in this area. Overall: The pop-up coupon was good, the e-mail program has been useless to us, which was a big reason we signed up for your services. Pros: So many different ways to partition and target customers, for both automated emails and newsletters. The built in templates cover a Whole lot of uses that are easy enough to make and personalize. Cons: Could be more accurate on the location aspect of it. Overall: Our marketing has greatly improved since switching to remarketing. Very robust system with an intuitive dashboard. Pros: Very intuitive platform. Once you create a basic email template, you can quickly fire out emails with ease. Also has many types of autoresponders to try to salvage as many sales as possible. The abandoned cart and abandoned browsing features are of the best emails. Cons: I wish the service was cheaper and I really wish the service was compatible with more vendors like JustUno. Overall: Increased revenue from marketing emails and less time spent doing so on an intuitive platform. Pros: Easy of use, support for setting up is good. The options that gives for segmentation are also 'good enough'. Cons: I had bee using for almost 2 years. The improvements and updates are not made regularly. There's no continuous improvement. Pros: I love the automations! I have set-up an extensive set of automation campaigns that makes sure every customer gets contacted with the right offer under the right circumstances. It's been very successful and worth every penny! Cons: I wish there were more segmentation options to further define my customers. I would like further campaign options for automations and more marketing ideas to use in my efforts. Pros: I like how user-friendly Remarkety is, and how well it integrates with Yahoo stores. I also really like how in-depth the statistics are and the options for testing different strategies. Cons: I haven't experienced anything to complain about with Remarkety. Overall: Overall, I am very happy with Remarkety. The customer support is very helpful! I highly recommend Remarkety. Pros: Very impressed with how quick support was able to help solve a problem that I had created myself by setting an option wrong. Cons: Haven't found any part of the service that fails to meet expectations so far. Overall: We use it to manage our email marketing and test new things. The settings and reporting are very intuitive. We've boosted sales quite a bit using remarkety. Pros: The dashboard is nicely laid out. 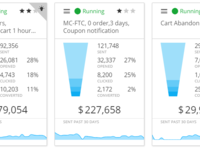 It displays relevant data about conversions, bounce rates, etc. It helps keep track of how you've done over time very well. Cons: The biggest complaint that I have is with the template software. I don't think it's as full featured as MailChimps template editor. Pros: The simplicity and customer service. Automation is easy to set up. The recommendations to make more money off lists. Being able to integrate to third party softwares. Cons: The email builder. The preview section isn't always accurate. Not being able to make my own sections is annoying. Weird spacing issues on long copy emails. Cta buttons can not be placed usually where I would like. A lot can be added to keep up to other email builders on the market. Overall: It's been great outside of the email builder. Customer experience was on point. Getting tips from remarketys email pros and the super quick/ thorough response from Omer really helped my worries with using this client over Klaviyo. Pros: I like the fact that it takes a snapshot of the competitor page. There doesn't seem to be many mistakes on the price that is pulled from the website. Cons: Not knowing how to really fix issues that have been ongoing for some time. Not having any kind of access to a dashboard to review and communicate any issues. Pros: Remarkety is very easy to use and have the most common automation opportunities we need. Overall: Remarkety is easy to use and give us the ability to make automations quick and easy. Steep learning curve but good to se how your emails are working or not.GDPR compliance is good. 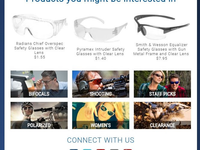 Pros: The easy to see results and cost effectiveness of each newsletter and automation. Most features easy to use. Expensive compared to other platforms.